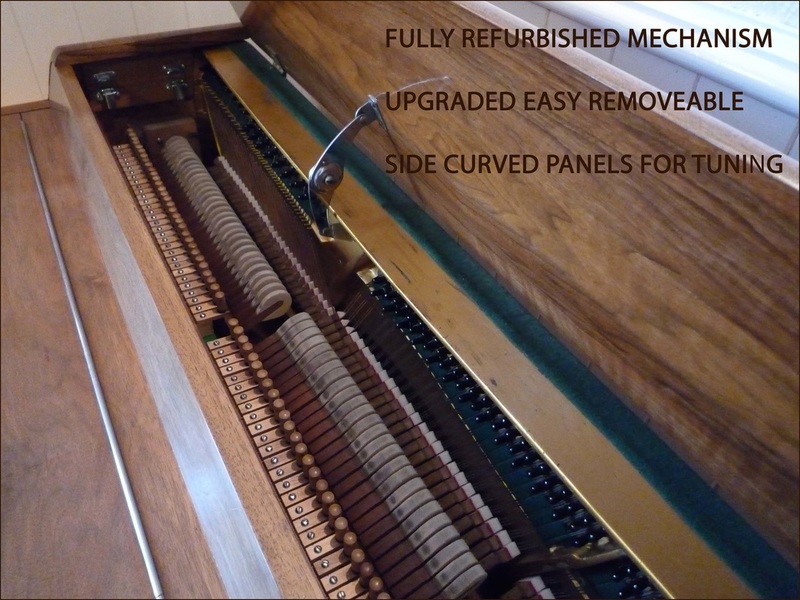 This Kemble Minx Upright piano + stool has just recently completed a full-on refurbishment program, here in the AA Piano Tuners workshop. 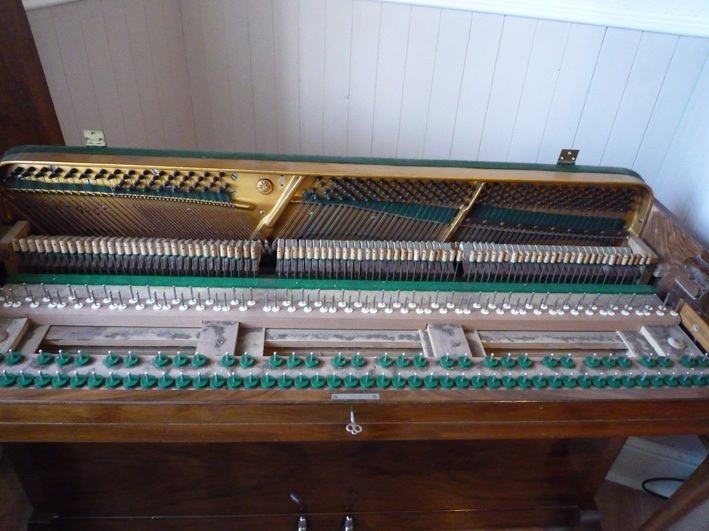 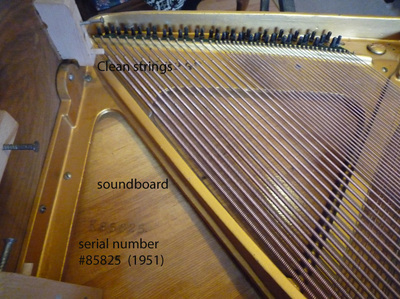 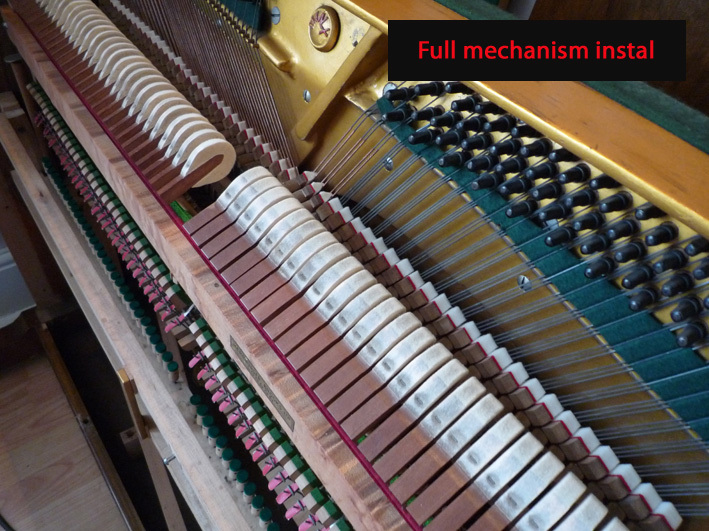 Although this piano is only 2ft 11 inches in height, it packs a punch for sound quality, having a full 85 note keyboard, and real bass + treble strings, spruce soundboard, laminated maple wrest plank, and a full action mechanism manufactured by one of the leading action makers "Herrburger Brooks" - originally from London, then moved to Derbyshire. 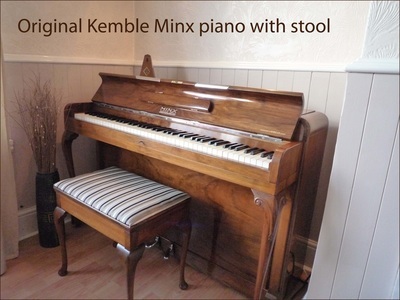 Kemble were established in 1911 by Michael Kemble, based in Milton Keynes, North London, and the Minx became a very popular model of the 1950s and 1960s, boasting many art deco features taken from the 1930s. 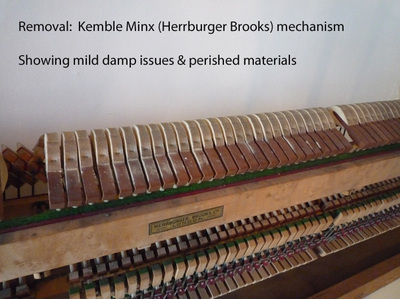 Kemble also made pianos such as Rogers, Squire and Longson, and after their Royalty recognition, they had a joint-agreement with Yamaha to build many more pianos. 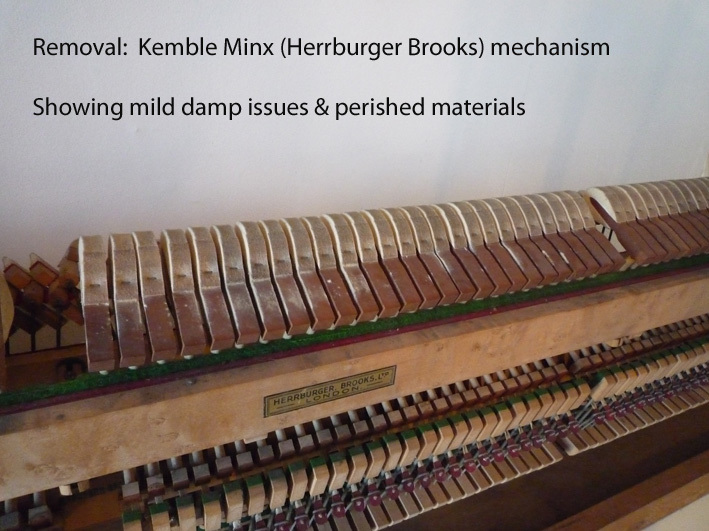 The name "Kemble" was taken over by Yamaha, and the name is still used today - manufacturing well over 300,000 pianos! The piano boasts many features including a well-looked after cabinet; late art deco walnut and chrome. 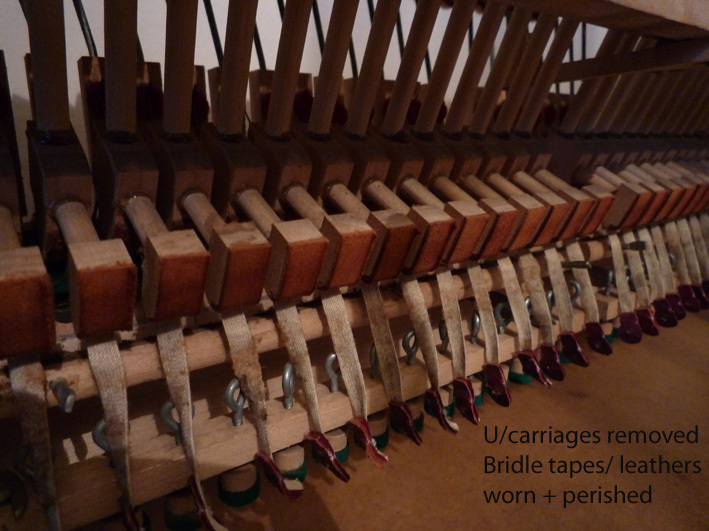 All the hinges, music clips, book rest, pedals and fixtures are still in perfect condition - just needed a polish. 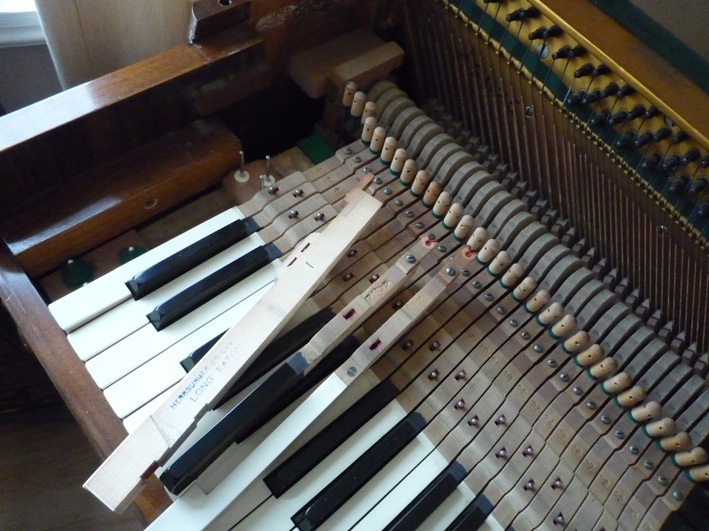 The cabinet had a few small scratches, and that has all been rectified during the refurbishment. 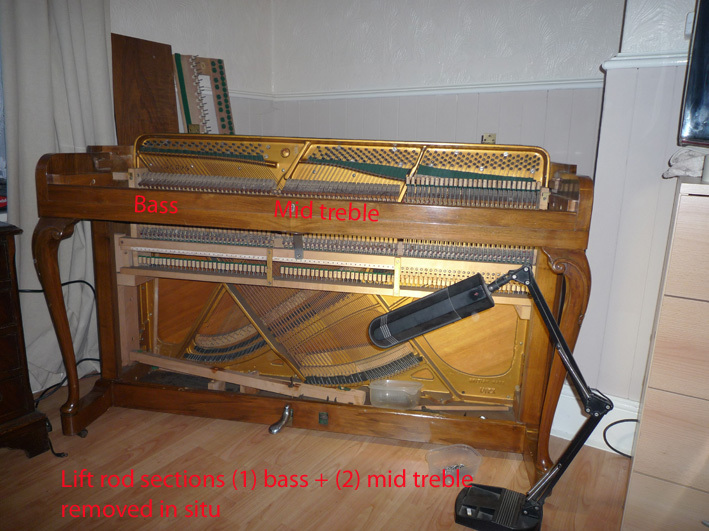 This particular model (Style C) - although not having box wood banding & parquetry work, it had all the original "workings" and fixtures for the old bakerlite down lights under the keyboard. 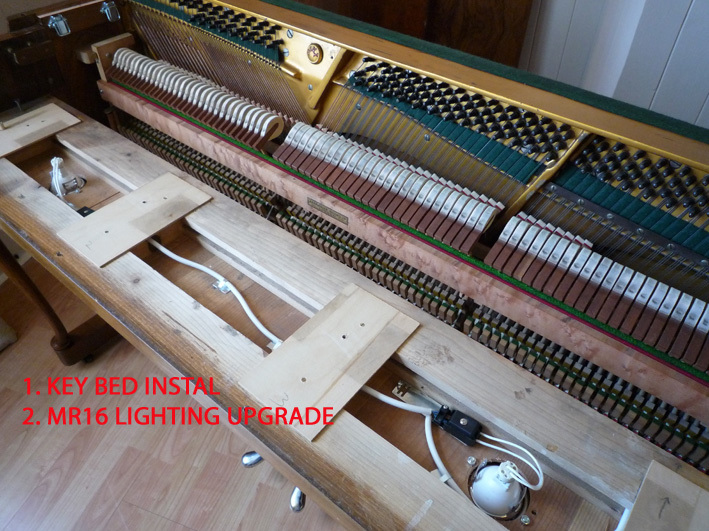 Regrettably most of the original fixtures/ light fittings were missing and damaged, and mmmm 1950s wiring looked a bit suspect! .... so all of this has been fully rewired with bespoke modern LEDs and a safety 12 volt transformer. 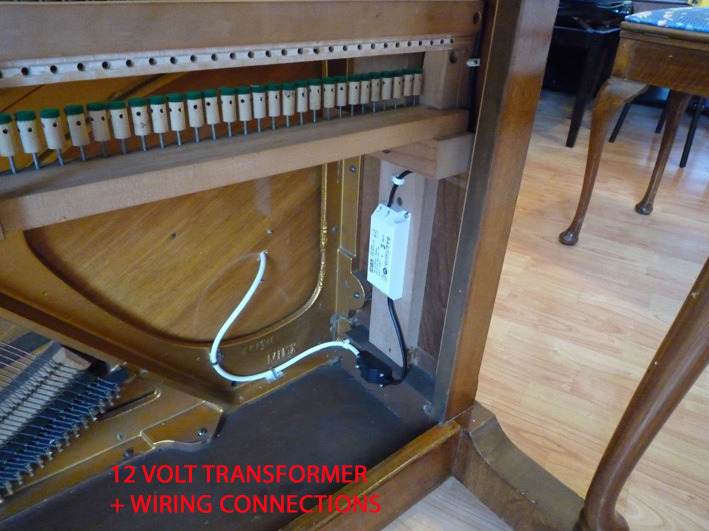 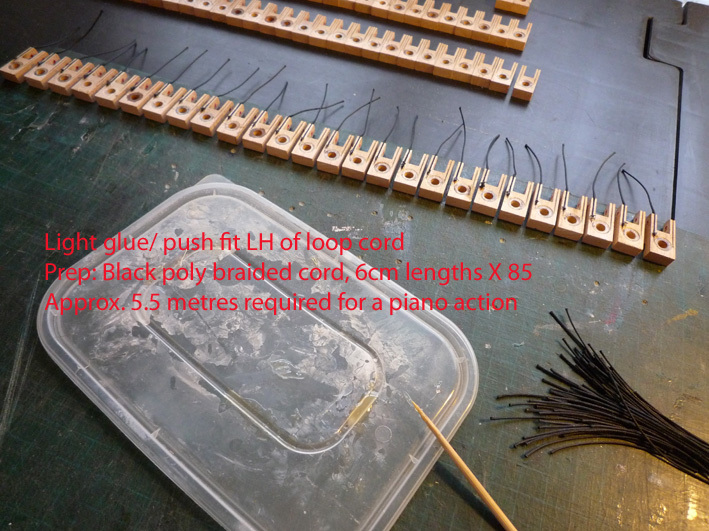 The on/off switch is under the keyboard, and the piano comes with a generous length of 2-core flex to plug into your wall socket.... all tested and working correct. 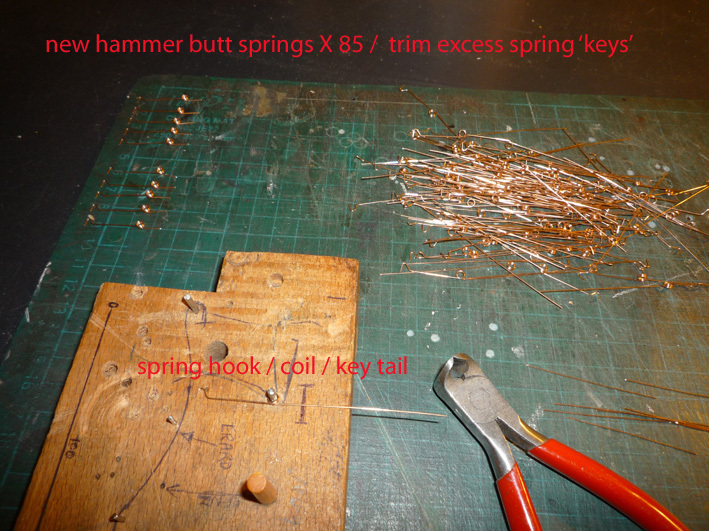 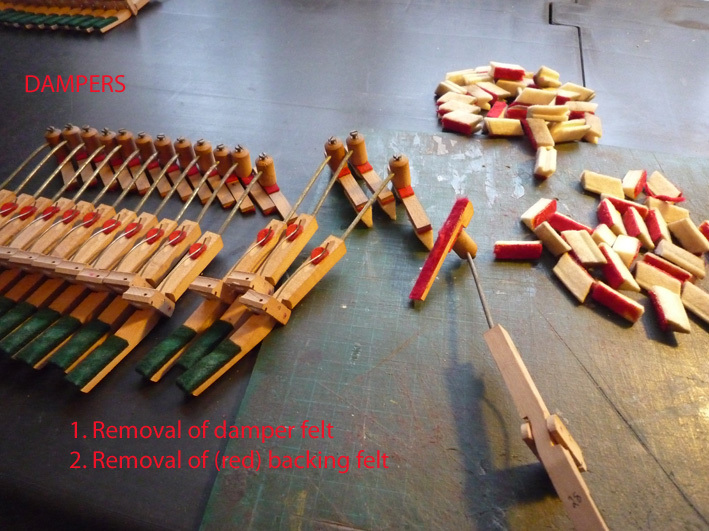 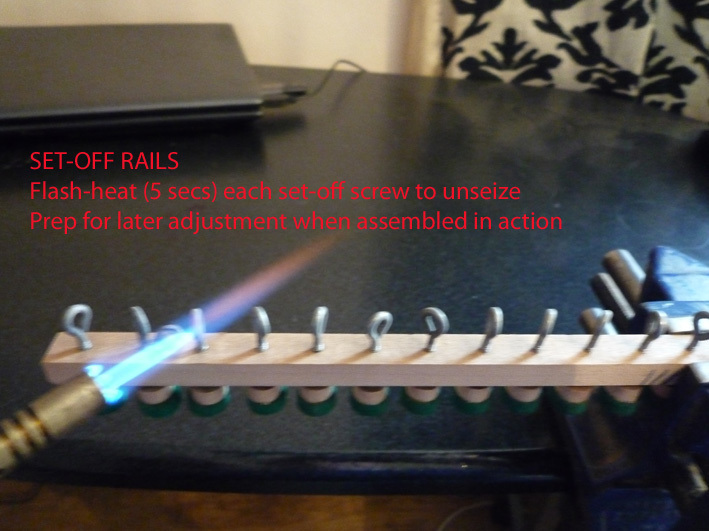 Images showing some removal + dismantling of parts/ general wear and tear. All mechanism parts, pedals, cabinet etc. were fully dismantled and stripped down - this process took about 5 weeks. 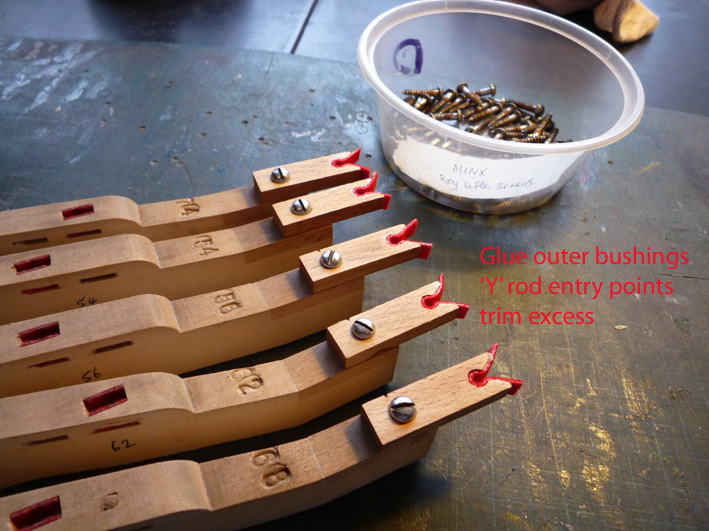 This often causes confusion about these "brief case" looking clips, however, originally the side curved panels were held in place with six screws (3 on each side). 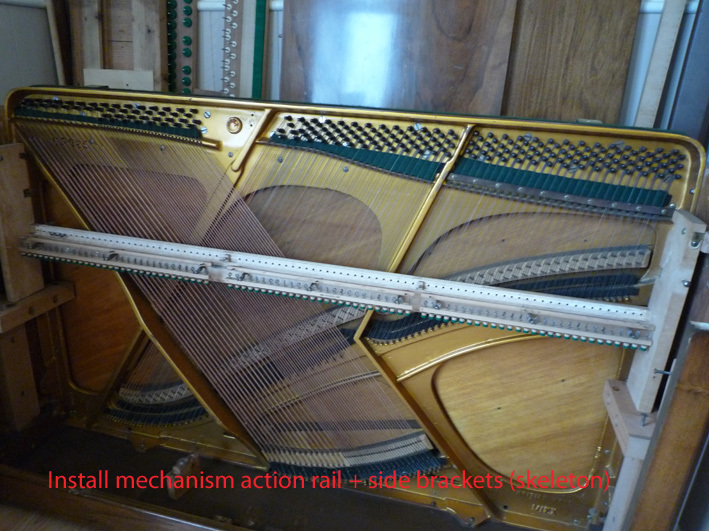 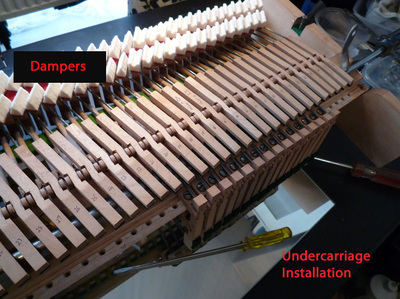 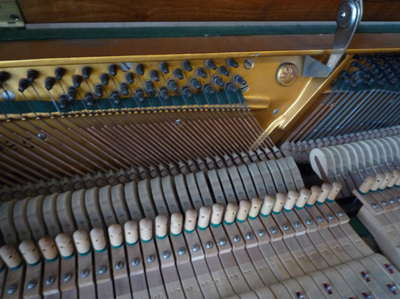 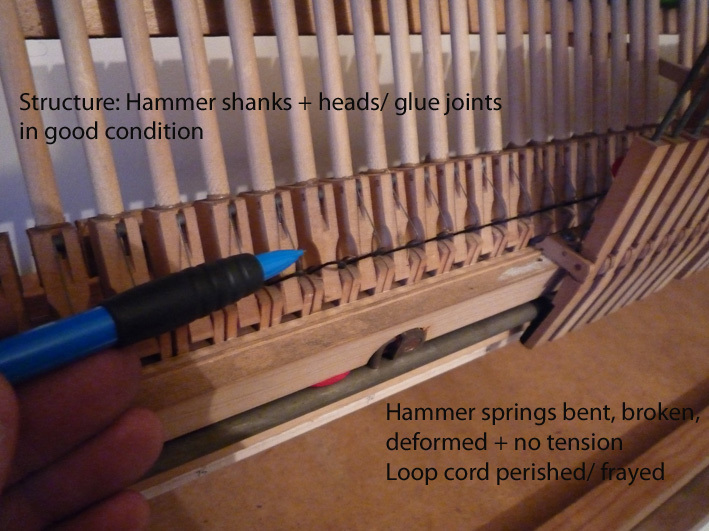 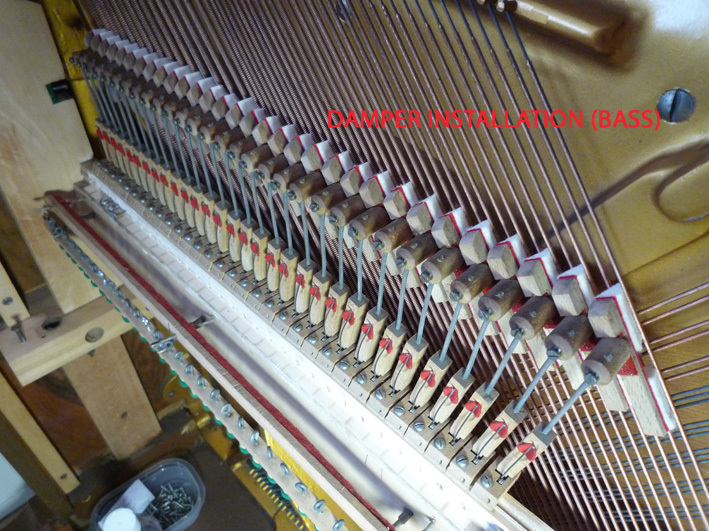 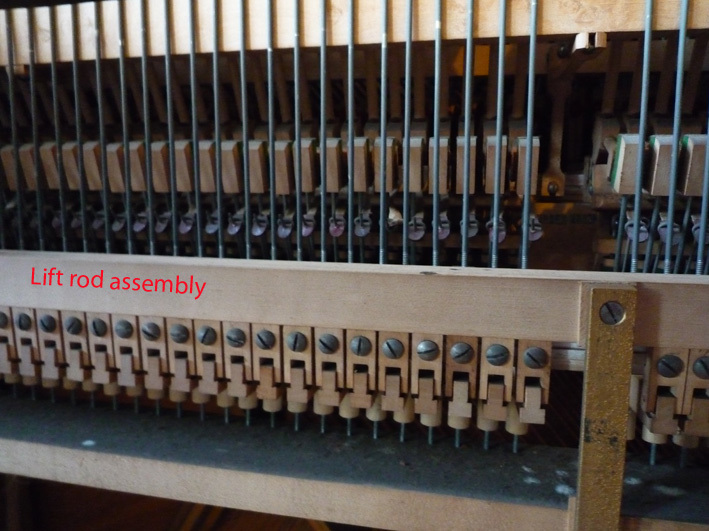 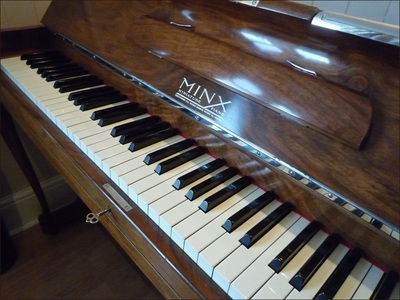 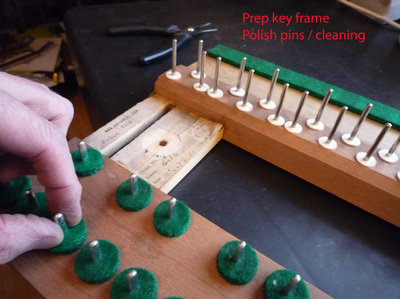 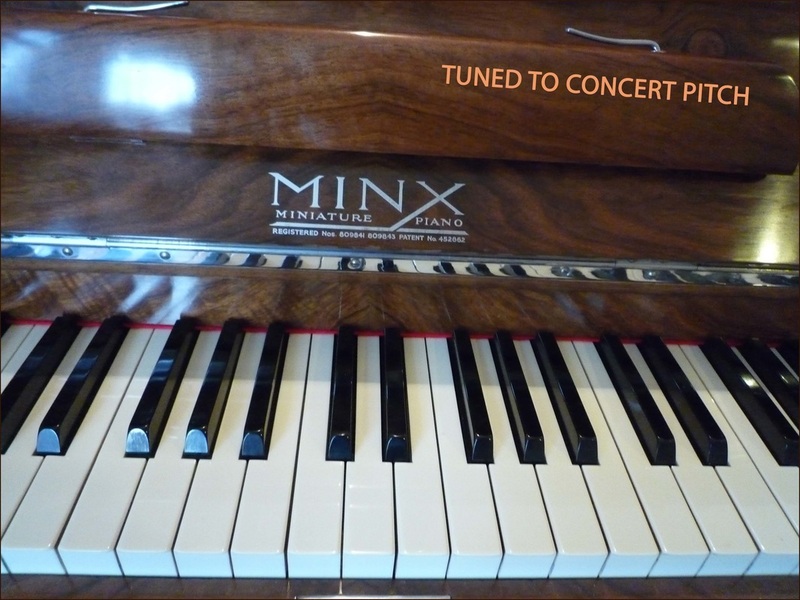 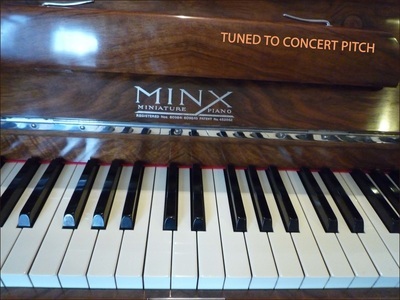 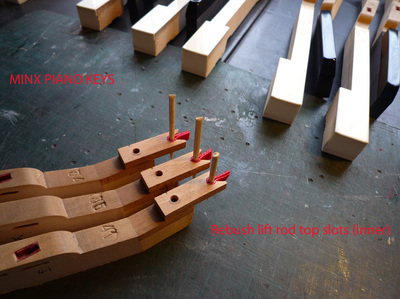 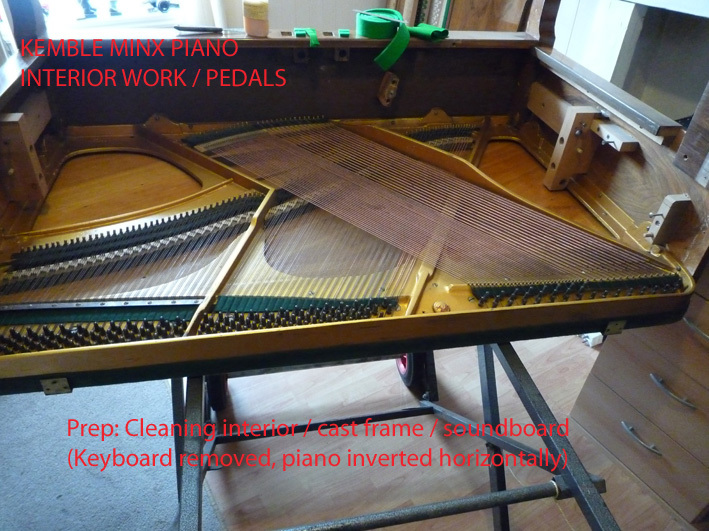 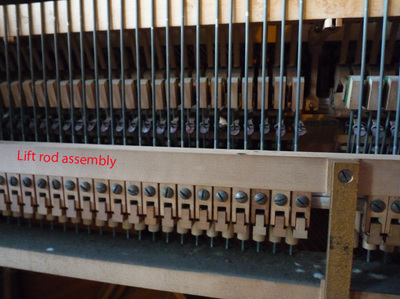 Later 1960s Minx pianos realised this may have been awkward for piano tuners to remove, so clips were fitted. The side panels must be removed prior to tuning in order to 1. 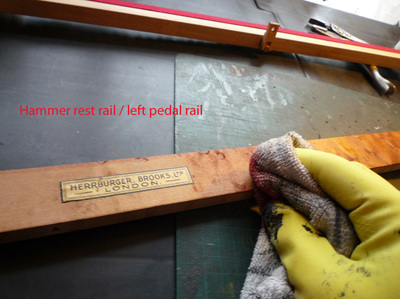 Remove the fallboard 2. 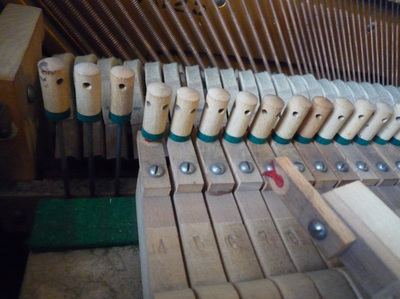 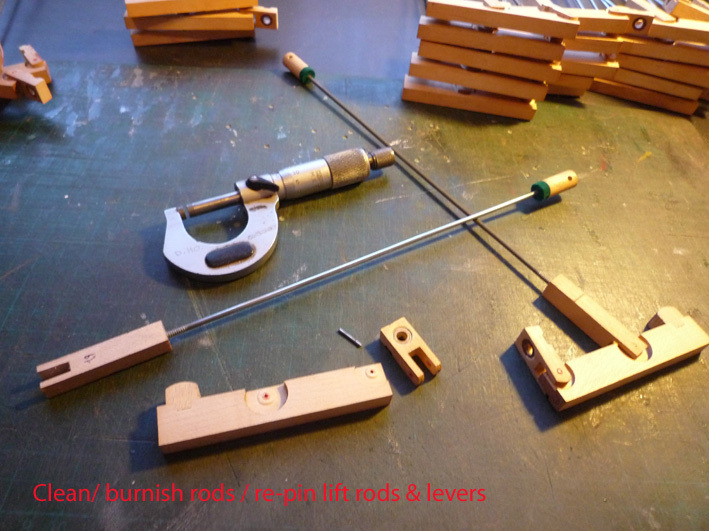 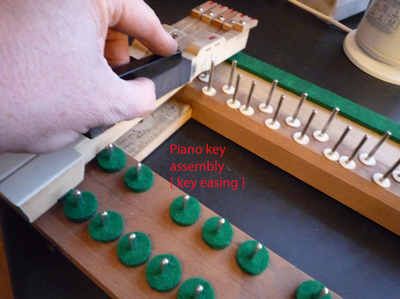 Access the tuning pins with a tuning lever. 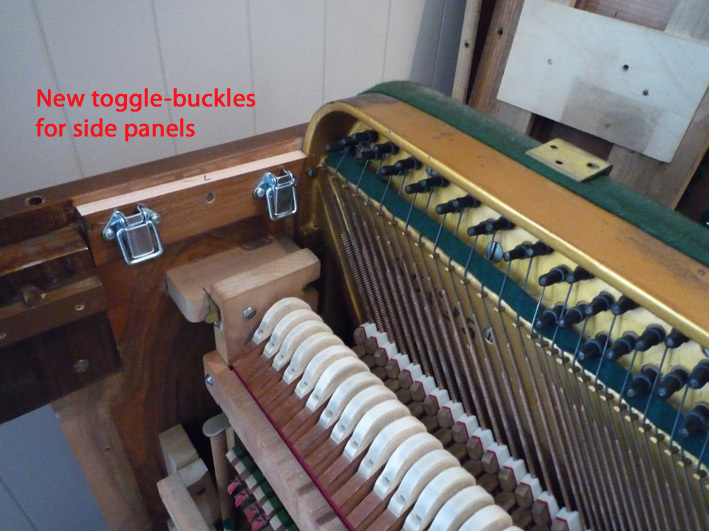 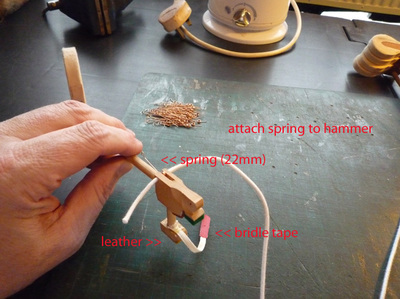 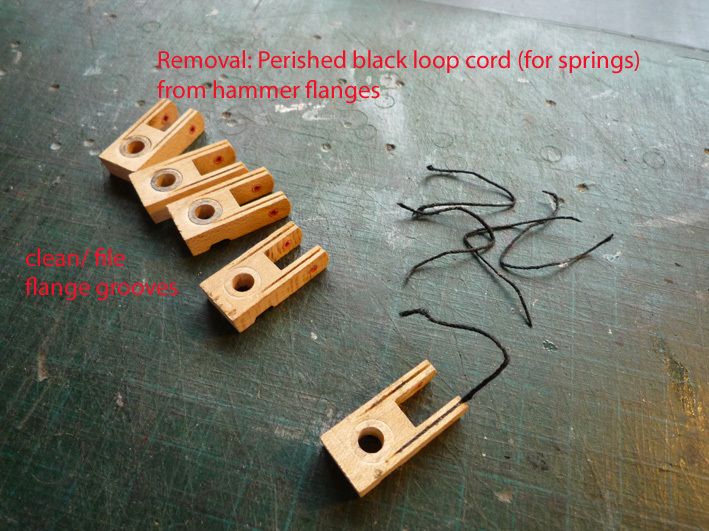 Therefore we have upgraded the side panels fixtures with the later toggle - buckle clips.... 2 on each side. 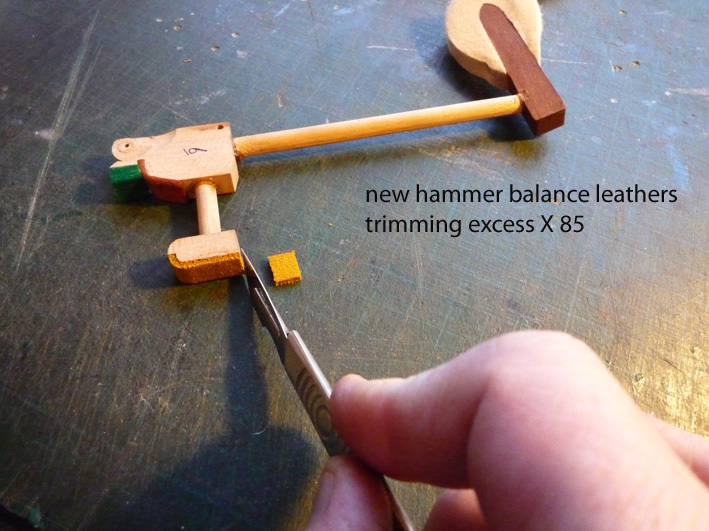 No more hunting for a small screw driver! 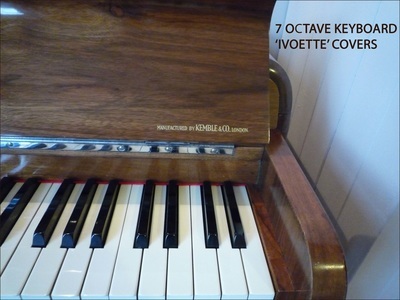 The bass and treble piano strings are original, and still in very good condition, and produce a pleasing tone when played. The tuning (wrest) pins are also in good condition, no rust, and have full torque. 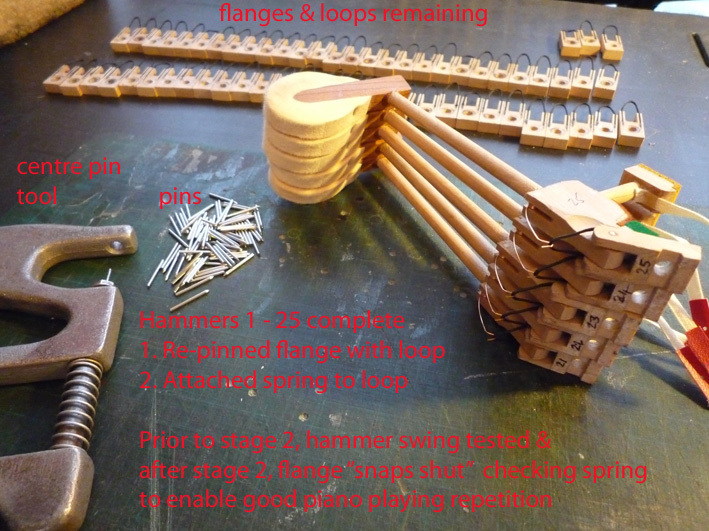 To reduce the risk of any string breakages during the pitch raise + fine tuning (a 3 day process), we lightly lubricated all string to bridge contact areas of down-bearing, and lightly coated the pin coils with silicone oil, then wiped them dry - avoiding contact with the wrest pin bushes and cast frame, which are in excellent condition. The whole tuning process from start to finish was a success. After purchase, we would recommend that the piano was tuned again after settling in the new home, then annually/ six monthly afterwards. 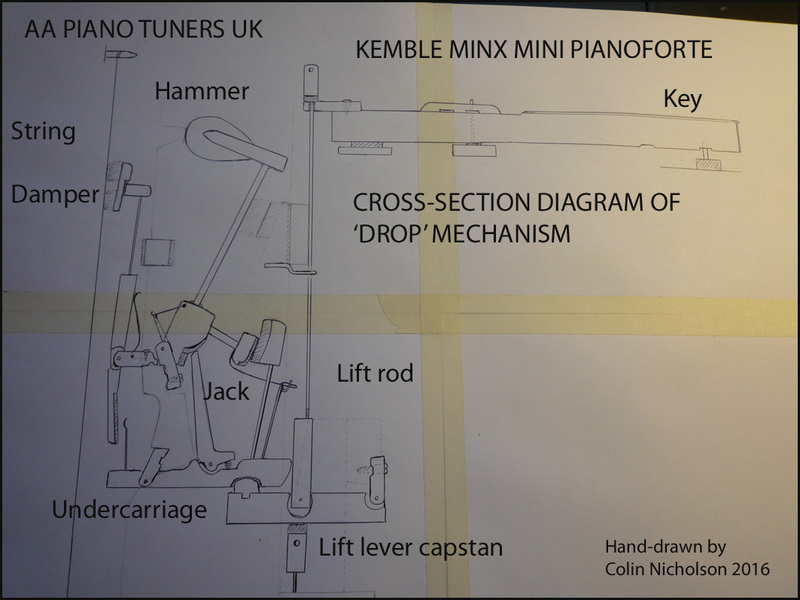 The mechanism, keyboard and pedals have all been fully regulated. 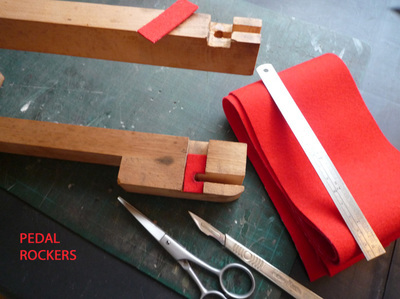 Due to excellent previous ownership, the piano has its own original matching piano stool. 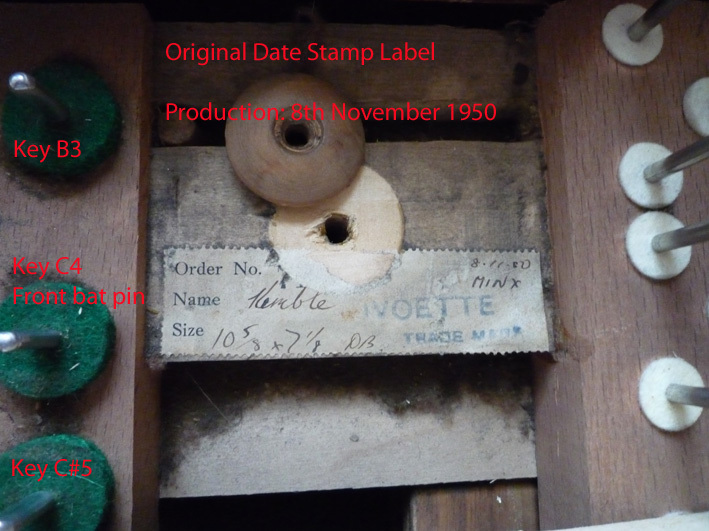 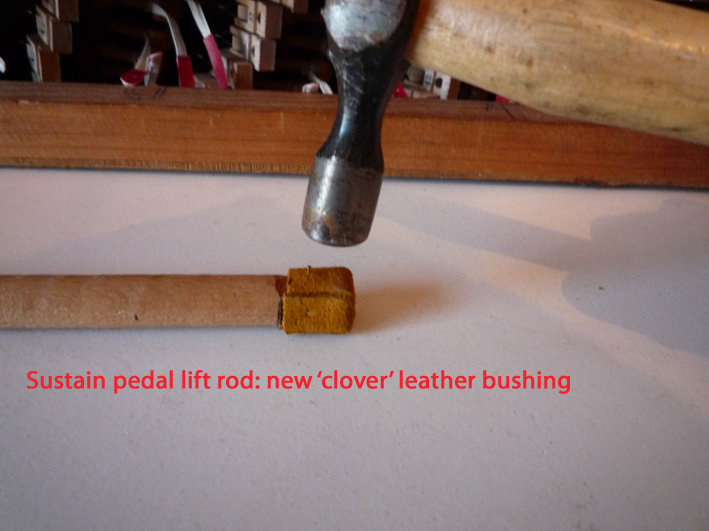 This is punched into the wood "K17" under the stool rim, and has been checked with Kemble/ Yamaha. 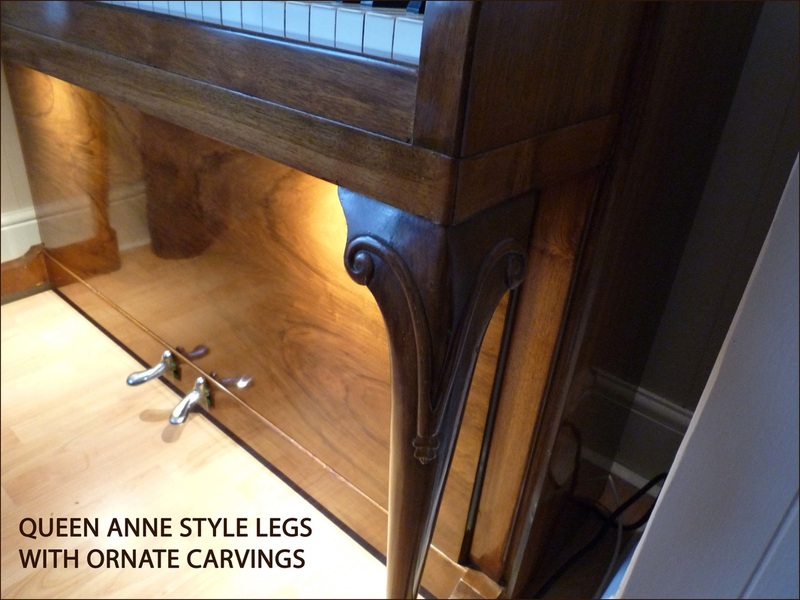 The stool was made specially for the Minx piano, reflecting the Queen Ann period legs. so after some research, we found a suitable pin-striped fabric and recovered the lid - as seen. 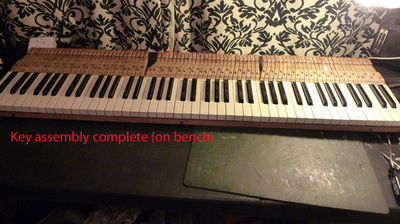 The padding is still original. 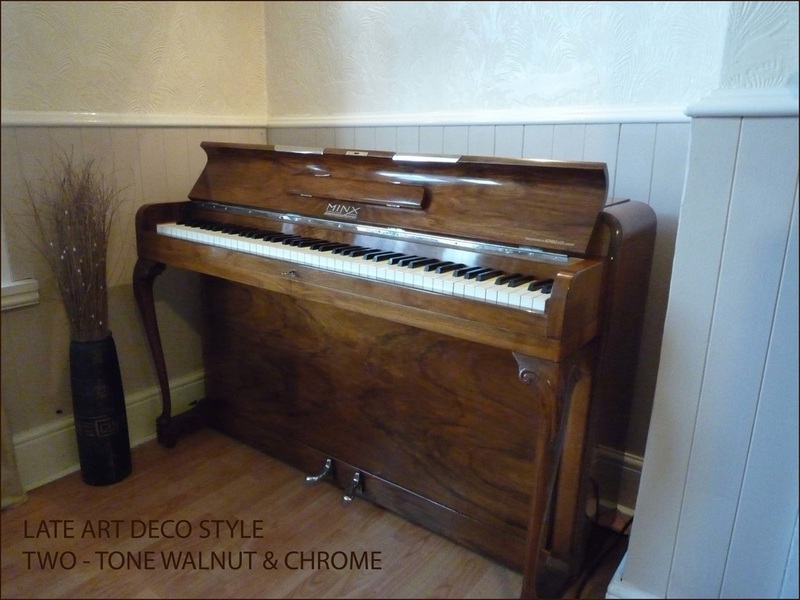 Also due to many scuffs and scratches on the stool, this was fully stripped down, chemically cleaned, and re- French Polished.... the least we could do. 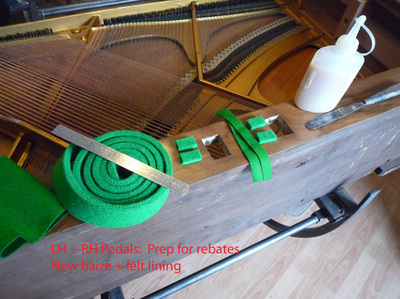 The piano also comes with its own original brown bakerlite castor cups X 4 to protect all floor coverings. Cabinet: Late art deco Walnut with detachable side curved panels for tuning / Chrome trims. 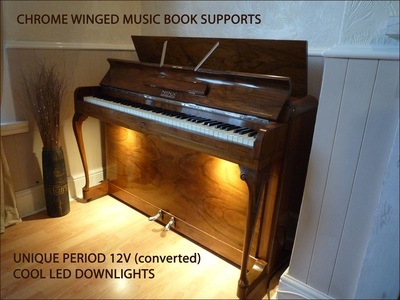 MR16 type bulbs / 5 watt (equivalent to 35 watts) "warm white" 53 X 50mm 12 volt. 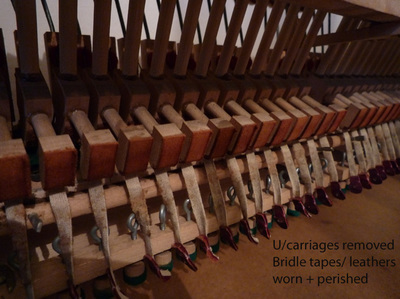 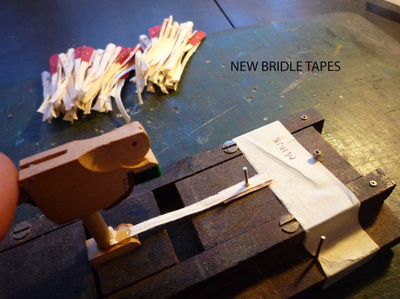 Thank you for viewing this restoration blog. To see our level of restoration work, also view our previous work & restoration pages. 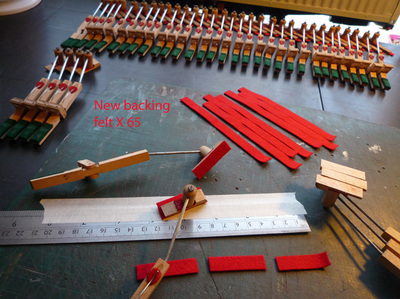 Lenz of Berlin (2014) and more. 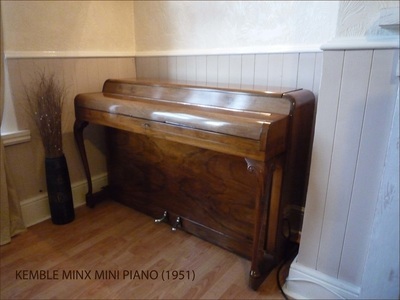 This piano has been sold.